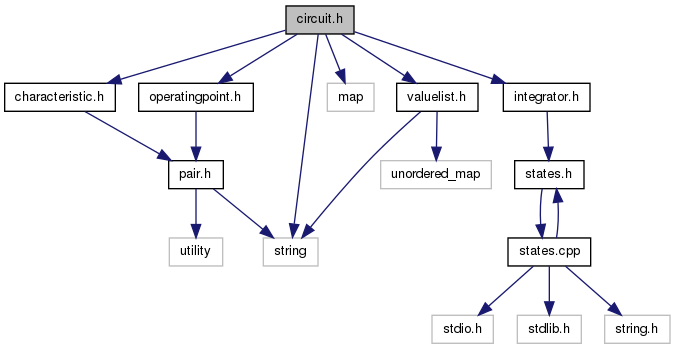 The circuit class header file. Contains the circuit class definition. Definition at line 52 of file circuit.h. Definition at line 49 of file circuit.h. Definition at line 37 of file circuit.h. Definition at line 38 of file circuit.h. Definition at line 39 of file circuit.h. Definition at line 40 of file circuit.h. Definition at line 41 of file circuit.h. Definition at line 42 of file circuit.h. Definition at line 50 of file circuit.h. Definition at line 43 of file circuit.h. Definition at line 44 of file circuit.h. Definition at line 45 of file circuit.h. Definition at line 46 of file circuit.h. Definition at line 47 of file circuit.h. Definition at line 378 of file circuit.h. Definition at line 379 of file circuit.h. Definition at line 376 of file circuit.h. Definition at line 56 of file module.cpp. Definition at line 58 of file module.cpp.